Diabetes affects many organs and systems, including your oral health. Keeping the sugar levels healthy will not increase your chances to have more dental problems compared with non-diabetics. However, if blood glucose levels are not well controlled, the amounts of saliva will decrease, the sugar in saliva will raise. Diabetes can also reduce the blood supply to the gums and impairs the function of white blood cells. Thus, you can experience various problems from dry mouth to loss of teeth and infections. If you don’t have enough saliva, your mouth will become dry and irritated. You may feel a burning sensation in your mouth, especially in your tongue. This irritation increases the chance to develop infections. Saliva also protects the teeth from developing cavities and helps you chew, speak and swallow comfortably. Thus, if you have less saliva in your mouth, you will be prone to develop cavities, lose your teeth and have troubles digesting the foods. Dentures also become uncomfortable as they will further irritate the gums. You may experience more toothaches because of the inadequate blood supply to the teeth. As a result, chewing solid foods may become difficult. The gums can also get inflamed and infected (causing gingivitis and periodontitis). Fungal and bacterial infections are seen more often in cases of poor controlled diabetes. Bacterial infections can increase insulin resistance and therefore raise the blood sugar levels, aggravating your diabetes. Fungal infections (known as thrush) occur because fungi thrive on sugar and will affect the mouth and the tongue. If diabetes is not well-controlled, the tissue repairs slower than normal. Poor healing occurs due to several factors: the blood supply in the mouth is low, the immune function is impaired, the nerves and other biochemical reactions occur in diabetes. As a result, it will take longer time to recover from an infection, after a surgery or other dental procedures. 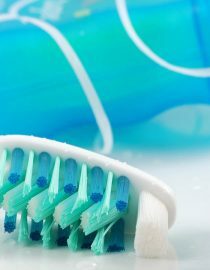 A good oral hygiene will help prevent infections during tissue repair. Maintaining your sugar levels healthy will improve the blood supply to your gums and will also decrease the chances to develop infections. Make sure you tell your dentist you have diabetes, so he/she will adjust the treatment and recommendations based on your condition. Schedule a check-up with a health professional specialized in dentistry (dentist, hygienist) twice a year. Pay attention to your oral hygiene; brush and floss at least two times a day. Do not smoke. Diabetics who smoke are 20 times more likely than non-smokers to develop thrush, periodontal infections and the wound healing is further impaired. Avoid very hot drinks and foods (they could irritate your mouth) and follow a healthy diet. You may use semisolid foods (or mix them in a blender) when you have dry mouth, toothaches or infections. Your fatigue in diabetes may not have anything to do with your blood sugar levels. Learn more about diabetic fatigue and how to feel more energized. You might also like...Can I Travel with Diabetes?